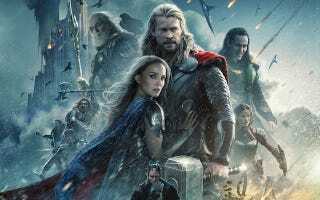 Thor: The Dark of the World is a total gamechanger for evil, spaceship-flying elves and hammer-throwing Norse gods. Thanks to director Alan Taylor's past work on Game of Thrones, we're getting to see the fantastical Asgard through the lens of reality, which only makes it more badass. Read what Taylor pushed for from Marvel, why the throne room had to explode and why man-braids are an integral part of Thor 2.
io9: There's a lot more fantasy in this film than in the previous film (which was mostly set in New Mexico). Did Game of Thrones help prepare you for that? Alan Taylor: I think Game of Thrones was critical to me being able to do this movie, and being able to feel like there is a straddling of reality and fantasy. I sort of thought that I had already been in that process [in GoT]. Also, from the other side, I think Marvel was interested in me because of Game of Thrones — by bringing me on, we all know what we're talking about here. It's trying to find that balance where it's fantastical but you don't disbelieve it. For me, it was epic and fantasy, but you absolutely relate, in a sort of intimate way, to this guy and his brother. It was trying to keep a human scale while it's big and real and dirty. And also while it's being fantastical. So there was definitely preparation there. I've always admired how much Game of Thrones tries to lean away from the fantastical, so when it comes you actually really savor it. In season one, when the dragons finally turn up it's not like episode 2, "DRAGONS!" You almost don't really believe it. They don't believe in dragons in that world either. So when they turn up there's a real "wow" quality to it. I really admire the way they handle it. It's funny you say there's more fantasy in this version — yeah, the whole thing is ridiculous. It's a guy who flies around with a hammer. We had more realms and our villains are pretty fantastical. There were days when I thought, "We're shooting elves on a spaceship… if we can make this at all believable we're okay." And that's the premise: Elves on a spaceship and Vikings jumping through portals. When you really think about what it is, outside of the Marvel Universe, it's crazy. It's crazy! There's one point when Asgard is being attacked. We had to invent vehicles for the Asgardians, because we were spending more time in Asgard. So it was very important to draw upon Viking iconography [for this creation]. So we basically created a Viking longboat, but it just happens to fly and have torpedoes. And there's one point when one of them shoots up in the air and goes after the elves — it's ridiculous. But at the same time it seemed like a coherent world. I think one of the things that really helps ground the fantasy in this film is how organic Asgard feels. Even the Rainbow Bridge seems much more tangible in this movie. I wanted to shoot on location, I wanted to shoot on sets that were built exterior. So we had a portion of Asgard that you could actually walk around in, in the sunlight. Outside of Asgard I wanted to stage actual battles in the actual woods. We went to Iceland to do that, otherwise it would have been just a greenscreen box. Instead, we had actual Icelandic landscapes — that meant a lot to me. I wanted to get backstage in Asgard. The first movie — it was a design choice that I didn't go for, but I can't say enough brilliant things about how Kenneth Branagh launched this world and this cast — but the shininess of it sort of turned me off. So I was trying to get more texture into the world. I was excited that when we finally got into the throne room we got to blow it up, destroy it. Did you find that blowing up Asgard made it more organic? You make it feel vulnerable, which makes it feel real. But I was enjoying things... like, we go into the pubs briefly in Asgard. We go into the backstreets a little bit. We see the training ground — not the palace that's all glossy, but where the actual grunts are there rehearsing warfare. It felt like we were seeing backstage a little bit. And also we shot some stuff in Norway to give it a real landscape. I was shocked at how funny this movie is. I'm so glad to hear you say that. I came in to dirty it up, to make it darker. And then Disney started calling it The Dark World, and I thought, "Okay, dark!" But at the same time we were making this, I thought, "If we don't make this funny we're screwed." Because this is Marvel and you have to be doing both. And I'm so grateful to be hearing that people are responding to the humor. How do you balance the humor and the grime? It goes beyond grime, we are actually [MAJOR SPOILERS] killing beloved characters. So how do you do that and then two scenes later do a joke? We kill a beloved character and then a few minutes later there's a joke where a cellphone rings and Thor says, "It's not me." I thought, if we can do that switch, where we just killed somebody, and now we're doing this, we're in good shape. On one hand, it's very much Marvel to do that. To be aware of the ridiculousness of the thing, to step back and let it be ridiculous. On the other hand, all of my favorite filmmakers are always dark and funny at the same time. I went to NYU film school because Martin Scorsese was god back then, and he's always funny and he's always terrifying. That balance is the stuff of life. Speaking of the bloodshed, the movie is also really violent — you slice a character's arm off. Was there anything you couldn't get away with? It's funny you say the word bloodshed. Because, if you notice, there's almost no blood ever. That's because Marvel doesn't do blood. Partly because the rating we wanted to go for doesn't do blood. And I've got three small kids that I hope will go see it, and you don't really want to do blood. So there's basically no blood. Even when we chop the hand off, we say it's a cauterizing knife that does it. You see some blood from elves, but that tends to be black, so it's less worrying. Probably the most blood you see is when Loki's trashed his cell and you see his foot's been cut. There's a lot of violence, there's death, but there's almost no blood. Was there anything else you tried to do that Marvel said no to? I was pushing for more history sometimes. I [wanted] more horses and I was told no. I love the fact that this was an ancient culture that actually had horses. I think there was a Marvel discomfort that when you have spaceships you can't really have horses, but you've got laser guns fighting swords, so that's already there. In my mind, this is a really refined culture and, just as we use fountain pens because we think they're cool, I think that culture would use horses for the next six billion years. It's not that they haven't invented the car yet, it's that they think horses are cool. That's why I wanted to use a lot of horses. Maybe because I was coming out of Game of Thrones and I wanted more of the same. That was the one time that I felt like I was being held back. Braids are really important to this movie. Yes! They are! I'm so glad you noticed! Aren't they cool-looking? That's actually a good metaphor for talking about the design of the movie. I didn't like the hair in Thor, I hated the hair on The Avengers. Getting the hair right became a symbolic, one small way of saying this is what the movie is going to look like. Thor's outfit has changed, his hair is completely different. I look at stills from our movie and I think "that is a Norse warrior." His Dad's got braids. And it's not girly when you put it on a warrior. Braveheart had braids. If you look at that and do a close up of The Avengers' Thor, just in terms of the look of the thing, I think he's come a long way.